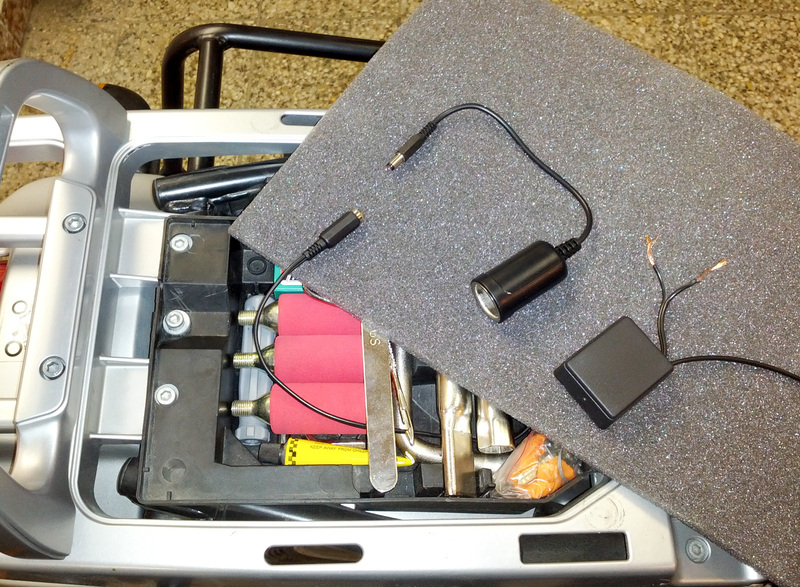 I want to place my battery pack into detachable topcase behind the rear seat. That is why I want to place the connection of the power outlet from the topcase into the toolbox under the rear seat (in some waterproof way if possible). 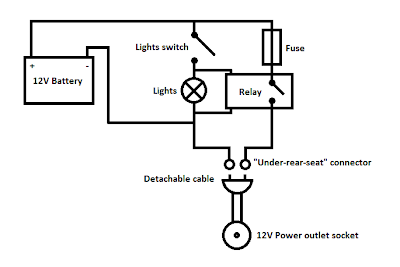 The scheme of the circuit is described above. So here is everything ready. 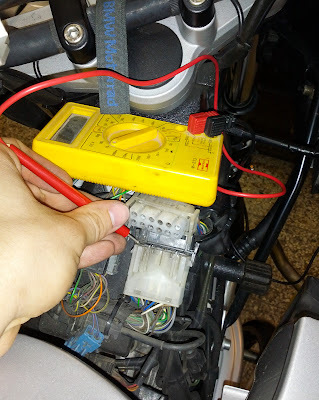 Now the most difficult part - finding 12V cable that switches the lights on (I am not sure if it is the side light or dashboard light). The connector with lights is located on BMW R 1150 GS under the gas tank. There is quite lot of cables and connectors in two rows above each other. The one with lights is in upper row of connectors, on right-hand side (from riders view). Then you have to find the proper pin of the connector. After finding out that the pin that switches on the lights is in left bottom corner (of above mentioned upper right connector) from riders view. The last picture (above this paragraph) is taken from handlebars back. Since the connector is waterproof I removed the cable insulation from the cable that is soldered to this pin about 2-5cm (1-2 inches) behind the connector. After removing the insulation I could solder a new cable that is controlling the relay. Then I insulated everything back again. 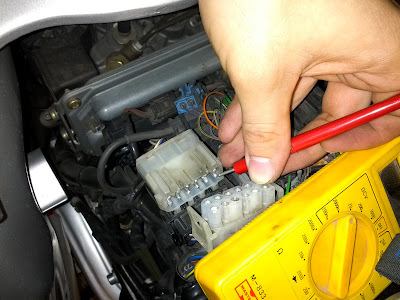 I fixed this "relay controlling cable" on several places to ensure its position and gave the tank back to its place. The relay is placed under the tank as well to reduce the possibility of short circuit caused by water. So everything is done, covered and works perfectly. 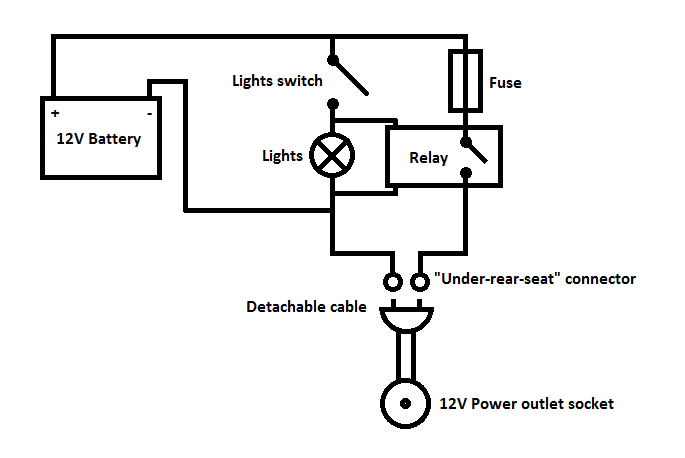 Everything charges only when the lights are switched on - so that solves the problem of lack of energy for starting the engine, when you forget something connected to the power outlet (for example overnight).